Heart attacks are one of the most common causes of death. The good news is that there are many symptoms that show the onset of heart attacks and thereby, it can be prevented if we try hard enough. But a recent discovery has shocked the medical world. While heart attacks may be common for both men and women, the symptoms are not identical. 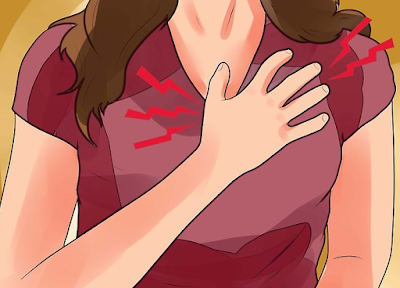 The chest pain experienced by women is much different than those which are experienced by men. For men, the chest pain has been described as a burning sensation or a dull ache. However, for women, it is more of a tightness or crushing pressure. Women also experience neck, jaw and back pain, unlike men. This is generally followed by palpitations, whereas men feel weakness and exhaustion. Women have also reported experiencing indigestion, nausea, dizziness, and cough. According to Atiq Rehman, MD, one of the reasons for the difference in symptoms is that since women have to work in different areas every day, which includes office, kids and family – they get stressed and depressed which masks the common symptoms. One of the reasons why women suffer from ischemic heart disease is due to narrow arteries. Women who have ischemic heart disease also have their major arteries cleared of plaque but their smaller coronary blood vessels tend not to dilate or constrict properly. The result is a low flow of blood to the heart. However, this can be countered by proper exercise and medication. There may be a need for lifestyle changes too. Maybe going for low-fat food and meditation will help. One of the problems in women with ischemic heart diseases is that they have normal angiograms, which means that you can detect many problems beforehand. According to Cedars-Sinai Institute, women who suffer from menstrual cycles which are irregular or have problems with their estrogen levels have more risk of contracting a heart attack. Similarly, polycystic ovary syndrome can be a cause as well. One of the major problems in our medical system is that when women go to the doctor with a physical problem like shortness of breath or maybe a chest pain, doctors tend to go for stress tests. That’s because these issues can be a wide range of things and stress is a likely option too. However, when the stress test is conducted, it ends up being normal or a false positive. We should rather go for a heart checkup when such a situation occurs rather than a stress test. Since this is new knowledge, we still do not have enough information on it. However, we must try to use the available information and go to the doctor immediately if something out of the ordinary takes place. And we need to cultivate a healthy lifestyle too.